When I was running the RSC there was still a Lord Chamberlain — the censor. Peter Brook did a show called US, which was a kind of sub-Brechtian critique of the American presence in Vietnam and this was at a time when it was still thought jolly good that they were in Vietnam. It hadn't gone wrong... this is '65, '66. I knew we had to get a license for this play and I knew that it was politically not likely to meet approval, but it had nothing morally or ethically or sexually dangerous; it was simply... it’s politics. So we got no reply from our submission for a licence until the last week, the week before we opened. I was getting quite nervous and I was rung up by St James Palace and was asked if I would go and take sherry with the Lord Chamberlain after office hours in a day or two. So along I went and I was sat down on the sofa and given my sherry and the Lord Chamberlain said to me: ‘Hall, this play US, I mean I haven't read it myself of course but my readers tell me that it's really not on’. And I said, ‘Really?’. And he said, ’Yes, I mean, do you think it right that a theatre in receipt of public money should do a play criticising our great ally with whom we have a special relationship?’. And I said, ‘Yes I do, if that's what we believe’, having thought about it and considered the question, ‘Yes, I do’. He said, ‘You know, I cannot agree with you, I think it's absolutely reprehensible’. And I said, ‘Aren’t we talking about free speech?’, and he said, ‘Look, there's no point in prolonging this discussion, drink up your sherry, that's the end of it, Hall. I have to tell you I'll be having a word with your chairman in the morning’. Fortunately my chairman was the same wonderful Sir Fordham Flower who, as his maverick act, had got me into the RSC and into London in the first place. And he rang me up the next morning and said, ‘What is all this nonsense?’. And then I said, Well, you know, that's it, they don't want us to do it’. And he said, ‘Well, do you believe in what's being done?’ and I said, ‘Yes. You can argue about it but certainly I believe in what is being done’. He said: ‘Well fine, go ahead; see what happens’. So we were then given... we said we were going ahead. We cut one or two tiny, tiny things, not very much, and we got a licence which was only for the weeks of the run of this particular play. I mean it was one of those civil service fudges so that under no circumstances could this be seen as a precedent for more anti-American propaganda. And it was done and I survived, which I wouldn't have done had I had most kinds of chairmen, I have to say. I mean a phone call from the Lord Chamberlain saying your chap is not playing the establishment game and that would have been the end of it. So, you know, I've had many years in politics, although I've been, in theory, in the theatre. And I like politics, although I despise them but they interest me and I also... I find committees and the way committees work extremely interesting. I mean otherwise I couldn't have survived all these years of sitting on Boards. There's a moment with most committees when you can reverse the decision completely if you pick it at the right moment and it's fascinating to see how people dance round that moment. On the whole I think committees come up with the positive answer, but it's...it’s quite thin ice sometimes. 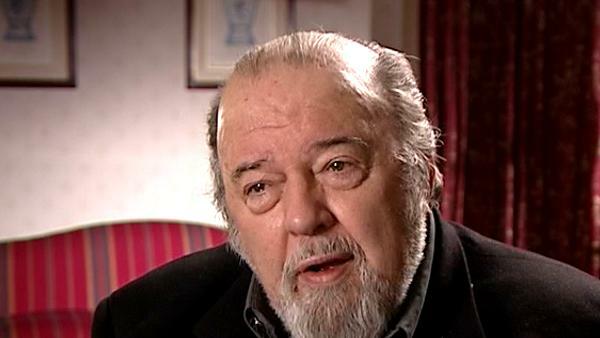 British-born theatre director, Sir Peter Hall (1930-2017), ran the Arts Theatre where, in 1955, he directed the English-language premiere of 'Waiting for Godot' by Samuel Beckett. He also founded the Royal Shakespeare Company when he was only 29, and directed the National Theatre from 1973 to 1988. He was at the Shakespeare Memorial Theatre in Stratford-on-Avon for two season from 1957-1959. He also directed 'Akenfield' for London Weekend Television and ran the Peter Hall Company, which has 40 productions worldwide to its name. In 1963, he was appointed Commander of the Order of the British Empire (CBE) and in 1977 was knighted for his contribution to the theatre. In 1999, he was also honoured with a Laurence Olivier Award. Head of Press at the National Theatre (1974-1988), and earlier at the RSC (1960-1974), John Goodwin is the author of a best-selling paperback, A short Guide to Shakespeare's Plays, and co-author of Trader Faulkner's one-man show, Losing My Marbles. He is also editor of the play, Sappho, based on Alphonse Daudet's novel, and editor of a number of successful books, among them, Peter Hall's Diaries, and, British Theatre Design - the modern age.